British cartoonist Paul Thomas has built his career on political cartoons. But for his latest project, he’s applying his sense of humor and deep artistic talent to exploring the past with an unconventional focus: tattoos. 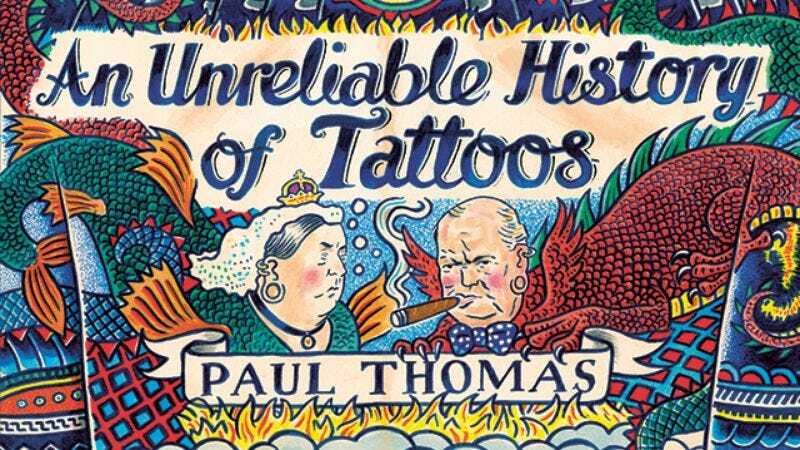 The title of An Unreliable History Of Tattoos implies that Thomas isn’t to be trusted with his tales of major historical figures getting sweet ink all over their bodies, and that cheekiness can be found throughout these preview pages from the new Nobrow graphic novel debuting next month. It’s a very silly book, but also very clever, and Thomas uses tattoos as a way of revealing what’s under the surface of each figure by painting it directly on their flesh (or copper, in the case of the Statue Of Liberty). This preview spotlights Thomas’ sharp skill for caricatures, but also his evocative compositions, bold tattoo design, and lush painting, making each page an engaging piece on its own. This history may not be true, but it sure does look great, and it’s a hell of a lot more fun than what actually transpired.